In 550 words or less: Provide specific information regarding your experience, achievements and steps you have taken toward your goal(s); how your plans increase the probability of reaching your goal(s); and why you think you will succeed. ​DO NOT include personally identifying information, including name, address or email, in your essay. On a 8.5in x 11in piece of paper, create a 'visual poem,' in a style of your choosing, on the theme of overcoming a personal challenge. In 500 to 1000 words: Include a personal statement that gives an idea of who you are and how your poem relates to a challenge you've faced. Christopher Hitchens once asked: “To whom would you delegate the task of deciding for you what you could read? Do you know anyone…to whom you would give this job?” Do you? Why or why not? Write about a time you or someone you knew didn’t speak up, or almost didn’t, for fear your idea might be unpopular. ​What did you learn from this and would you do the same thing again? What makes you think free speech is important, even in high school? Please write a thank you note to the jerk you listened to… and learned something from (though perhaps that didn’t happen right away). In no more than 250 words: What were the most difficult or challenging math or science courses you faced in high school and what strategies did you employ to succeed? In no more than 200 words: Whenever you are faced with academic challenges in learning either a new concept or subject matter, what strategies do you use to learn the new material? In no more than 500 words: If you could imagine yourself 25 years into the future: What would you be doing and how is that connected or related to what you are learning now. How will that benefit your community, society and the world? Please answer all above questions. In no more than 250 words: Outside of the classroom, what of your extracurricular or co-curricular experiences led you to be passionate about science and technology? In no more than 250 words: If the STEM Scholars Program staff were to meet you, what key characteristics or attributes about you would you share in that meeting. Tell us something you think we should know about you that has not been included in the application. Create a short (5-7 minute) video documentary on a topic related to the new 2018 competition theme, "The Constitution & You: Choose a provision of the U.S. Constitution and create a video illustrating why it's important to you." In no more than 500 words: Why is a college education important to you? In 140 characters, complete this sentence: "Instead of spending time with technology, I'd rather..."
In 450 words or less, describe how agriculture impacts their daily life and how it will feed the world with the growing population. help you achieve your future goals? achieve your dreams of going to college? Please describe why you need financial assistance. An essay of 500 words or less reflecting community activities. How do you feel these experiences have prepared you for life? Why is community service important? Detailed list of community service activities occurring within the last two years. Have been accepted for admission or currently attending one of the nineteen 1890 Historically Black Land-Grant Universities. Study agriculture, food, natural resource sciences, or other related academic disciplines. In 250 words or less: "We want to know... what do you dream about? Whether it's some bizarre dream you had last week, or your hopes for the future, share your dreams with us. In 12 point Arial font and no more than four double spaced pages, address all four of the following prompts:​​ What are your long-term personal and education goals? How has knowledge or awareness about your own culture and other cultures affected your understanding of yourself? What key experiences with your own and/or other cultures influenced your goals and your interactions with others? Please provide specific examples. How do you plan to use your college education to make a difference in your community? In 1000 to 1500 words: How do you see technology impacting the world around us in the future and where do you see yourself in this future? In 500 to 1000 words: How is technology affecting sports? In no more than 250 words: Please describe the race relations activity (or activities) that you want us to consider. If you are involved in more than one activity, make sure to describe them all. In no more than 350 words: How did your activity (or activities) promote racial harmony, understanding, and respect and/or reduce racism, racial conflict, and misunderstanding in your school/community? Make sure to clearly describe how your work directly impacted these race relations matters. In no more than 350 words: How did the activity (or activities) affect your school or local community? How would you describe the change that your work has made? How many people (students and/or adults) were involved in your activity, and for how long? In no more than 800 words: When the population of a city grows, low-income people are often forced to move to more affordable areas outside of the city. Many initiatives have been proposed or implemented to keep affordable housing within city limits. Identify one such initiative and discuss its pros and cons. For students with a documented learning disability (a diagnosis of ADHD or ADD alone does not qualify) In around 350 words: This year’s essay assignment is to submit an expressive piece on Perseverance. You may write a letter, a poem, create a piece of art or write an essay about the experience where you have needed to persevere and stay the course in order to overcome your learning difference and how you may have grown because of this experience. This is your space to express how a situation, a person, or perhaps a challenge was instrumental in your growth. Be sure to turn in any completed scholarships on the Turn in for Credit Page. In 2500 characters or less: Jackie Robinson is best known for the courageous role he played in the integration of Major League Baseball in 1947. In fact, Jackie Robinson exhibited courage and humanitarianism on many fronts overcoming unforeseen barriers and challenges which impacted our entire social fabric. What kinds of obstacles have you overcome? What can young people learn and take away from a study of the life of Jackie Robinson? In 2500 characters or less: What do you consider to be the most pressing global issue today and why? In 2500 characters or less: Jackie Robinson embodied his statement "A life is not important except in its impact on other lives." Describe a situation where you took a leadership role, including why you led the project and how you were effective. How have you personally given back to others? In 2500 characters or less: Write an essay which conveys to the reader a sense of who you are. Possible topics MAY include experiences that have shaped your life, the circumstances of your upbringing, the way you see the world or any personal theme which appeals to your imagination. In 500 to 600 words, answer all of the following prompts: ​​Where are you planning on going to school? What is your desired major How did you develop your interest in teaching, art or opening your own business? How will the scholarship help you attain your goals ? Submit a college essay based on what you've learned from the Purpose Challenge toolkit. In no more than 500 words:​ How have you helped promote anti-bullying awareness in your school and/or community? Be specific about your outreach and its results. Share your own story about the experience of being bullied and how you have persevered and overcome the consequences and negative effects of such treatment. In 300 to 500 words:​ Share a short biography about yourself. In 2000 words: How has music influenced your life, passions, or ambitions? Feel free to include personal stories. In 250 words: Briefly describe a significant challenge you have faced in your life. Create a script or storyboard for a 30-second public service announcement (PSA) to help prevent distracted walking. In 500-800 words explain To what extent in the U.S. does the government–federal, state, and local–have the duty to monitor internet content? In 500 to 750 words: Imagine that you have the opportunity to travel back in time. At what time would you like to stop, and why? In 750 to 1000 words: Imagine you are backpacking through a country you have never been to before. You are interested in engaging with the local population and your backpack includes three items that will help them learn about your family and culture. What are those three items and how do they represent your background? In 1000 words: Please provide a summary of your personal and family background, including information about your family, where you grew up, etc. State any special personal or family circumstance affecting your need for financial assistance. Describe circumstances you wish the Scholarship Selection Committee to consider when evaluating your application. Submit two letters of recommendation. One from a teacher/professor, counselor/advisor or other school official who can provide verification of your academic status and is familiar with your academic record. The other should be completed by a teacher/professor, counselor/advisor or a member of the community who is familiar with your academic record and/or community involvement. An experience that has greatly influenced your life and why. Describe yourself and why you deserve to receive this scholarship. Who is your favorite role model and why? What has he or she contributed to society? Why you feel that parental involvement is important to your being successful? How will you use your talents and passion to help others? Create a one page resume (ask Ms. Amoah for a template if you are unsure how to create one). Submit three signed letters of recommendation from a Core Teacher, Coach, and Counselor. Identify a need in your community. Describe how you will create a solution to the problem. Describe your most meaningful achievements and how they relate to your field of study and future goals. Write a letter in the form of a poem to anyone/anything of your choice. ​ Create a one page resume (ask Ms. Amoah for a template if you are unsure how to create one). In no more than 500 words: Pick one activity (community service or otherwise) that you are particularly proud of and tell us what you did and why this was important to you. In no more than 500 words: Describe any family or personal circumstances, including, but not limited to, financial need, that have affected your achievement in school, work experience, or your participation in school or community activities. In no more than 500 words: How will your major/area of study contribute to your immediate or long-range career plans? In 1000 characters or less: Tell us about your educational and career goals and objectives. In 1000 characters or less: Please describe how and when any unusual family or personal circumstances have affected your achievement in school, work experience, or your participation in school and community activities. Tell us about an experience that has greatly influenced you life and why. Describe yourself and why you are most deserving of this scholarship. How has technology changed your life and how will you use it to impact the future. Submit two signed letters of recommendation. Create a poster interpreting the theme: One Person Can Make a Difference. How you promoted vegetarianism in your high school and/or community? Your successes, Your challenges, What you learned/what you would do different? How you expect to promote vegetarianism in college and beyond? Your future goals, Your strengths, Your weaknesses, Your "perfect" life in five years? Why you should receive this scholarship? How you became vegetarian and why you are vegetarian? How you define vegetarian? Why vegetarianism is important to you? What else is important to you? What vegetarian foods you would recommend to a non-vegetarian? What restaurants you would recommend to a non-vegetarian ? In 200 words or less addressing the following topics: activities, home life, plans for the scholarship money, how it will help you in the future, and what you would like the committee to know about you. Students should write a well researched and evidence based blog post. Students may choose the topic, however all topics should encourage a smoke-free world. Students may submit up to 3 blog posts to increase their chances of winning. In 500 words or less: Is there a particular African-American who inspires you because of the significant achievements in our society that he or she has been responsible for? In your essay, you should address how this African-American has been an inspiration in your life and discuss the contributions of the African-American individual who has served to inspire and motivate you. In 600-1000 words, address the following: 1) Why is it important to stop cyberbullying? 2) How has cyberbullying personally affected teens? In 750 words or less, answer one of the following: ​What is one thing that you would like to change in your community? How would you make a meaningful contribution to society to solve this problem? What is a meaningful contribution to society? How would a Youth Foundation scholarship help you gain the skills to solve this problem better? What is the most important goal that you have set for yourself? How do you plan to accomplish this goal? What is your major area of college interest, and how will that education give you the skills needed to work toward the goal? Submit two letters of recommendation Include a copy of your family's tax forms and W2s. 1) Why you want to be a recipient of an East Point/College Park Alumnae Chapter Scholarship? 2) Your goals and career interests? 3) The impact this scholarship would have on your educational career. Email your essay/article to: scholarships@a1autotransport.com along with your full name, contact information, and school you will be attending. Discuss the Importance of having your Life Safety Systems inspected, tested and maintained including Fire Sprinklers, Fire Alarms and Fire Extinguishers. On separate pages include student information and bibliography. In no more than 500 words: Describe a community of which you are a part (your school, your neighborhood, your family, your church, an organization, etc.) and tell us why it is important to you. In no more than 500 words: Describe a time in your life (in school or out of school) when you found something challenging. How did you handle it? In no more than 500 words: Tell us about yourself. Use your creativity. You can write poetry, math equations, a song, or whatever else shows us a little more about who you are! In no more than 500 words: Describe one of your ideas or goals that you have for yourself. What have you done or what do you plan to do in order to bring your idea to fruition or reach you goal? Examples could be something in your community, at your school, or in an extracurricular activity. Please elaborate as much as possible. Please describe a personal or academic setback that enhanced your character and helped you grow academically and as a community leader. ​What are your educational goals? How will this scholarship help you achieve those goals? What does leadership mean to you? Describe your leadership style and why it’s effective? Write about a time when "hard work" paid off. Describe your experience with community service and volunteering and how that has affected you and your outlook on life. (1) When did you discover your interest in the field of energy and what sparked your interest? (2) Choose one of the following questions: (a) what excites you about this field and how do you plan to make your personal contribution to the energy field? OR (b) How do you expect your education to prepare you to fully participate and contribute to the field of energy? 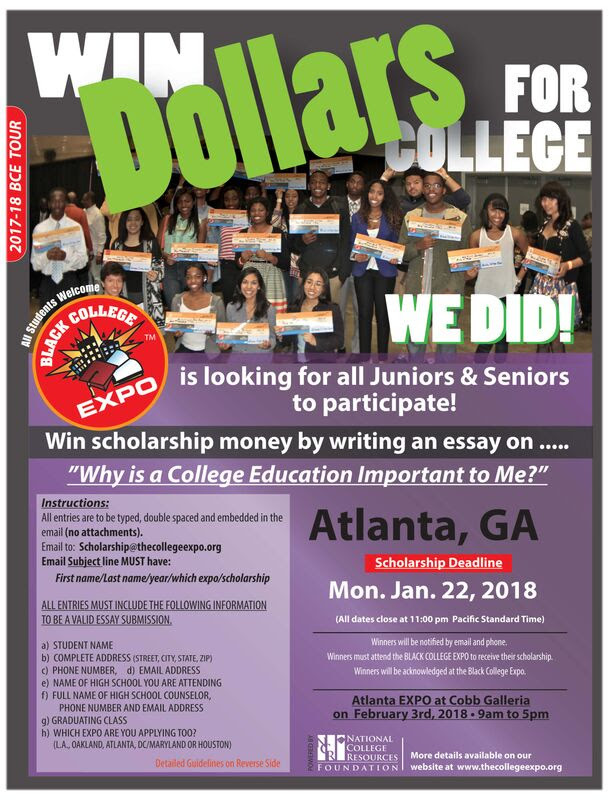 The application must be received by email G2AABEATCHAP@southernco.com or mailed to AABE Atlanta Chapter, PO Box 55216, Atlanta, GA, 30308-5216. Student demonstrates exceptional or proactive responsibility to give back to their community, and/or help others -- beyond the minimal volunteer hours required as a prerequisite for high school graduation. describe community service activities and responsibilities; additionally, please address what/who influenced you to give back to the community and others, the value of serving the community and others, and your future plans/goals related to community service. How has Anne Frank’s legacy inspired you to take action in your community? What actions have you taken and how will those efforts be sustained? Your essay should be typed, double-spaced, in 12-point font, with 1-inch margins and saved as a PDF. Submit 2 letters of recommendation from people familiar with with your work. Write a 500 word essay on why you think you deserve the scholarship. 3 letters of recommendation from teacher, counselor and personal reference (coach, pastor, etc). How will the Chi Mu Epsilon/Elizabeth Stamps scholarship enable you to further your education? In 500 words or less, write a letter of intent that identifies a problem and explains how the applicant intends to use her or his education as a way to begin solving that problem, creating a brighter future. How do you see technology impacting the world around us in the future and where do you see yourself in this future? All final essays should be submitted to trekkingpolereviews@gmail.com. In an essay of 500 – 1,000 words, promote a practical approach to a healthy lifestyle during high school, college or university years (whichever is relevant to you) and how these habits can be sustained over a lifetime. Please demonstrate knowledge of health and wellness and discuss why healthy living is a lifetime endeavor. What is the most important lesson you’ve learned from the senior you work with? How has working with seniors impacted your life/inspired you? How would you encourage others to spend more time with their grandparents or seniors in the community? Recommendation Letter from current school faculty member (Must be completed online by the recommender). What do you think will be the most challenging aspect of transitioning from high school to college? How will you overcome that challenge? What is your motivation to do so? Please be as descriptive as possible. 500-1000 words: Explain the racial justice issue of most interest to you. Identify a racial disparity in modern society and how you would use your education to bring about awareness or change. What is your definition of a Manhood? What are you doing to become a better citizen within your school, family church, or community circle? How would you use your degree upon graduation to better the community? Explain the importance of having an education? How will you use that knowledge to grow as a person today, and better society for the future? Why are you interested in the health care field? Describe a significant interest or experience that has had a major impact on your health care career goals. What is the innate talent(s) that you are most proud of, and how do you plan on further honing it and using it to benefit your community in a positive manner? Where do you see yourself within the next five years, and how do you feel that you will be contributing to society at large? What comes to your mind when you hear the term “Global Citizen”, and what sorts of characteristics does one exemplify? Choose a person, real or fictional, who deserves to be considered a role model or hero. Research the person's life and provide compelling evidence why the selected individual is worthy of being considered a hero. What do you consider to be the single most important societal problem in your community? How do we overcome this problem? What would be the benefits and consequences of questioning or challenging this societal problem for your community? Have you ever been treated unfairly because of your race, your religion, the way you look, or just because you are "different"? Unfortunately, many of us have. Tell about a time you were treated unfairly. How did you react? How did it make you feel? How was the situation resolved? Upload an official copy of a current academic transcript. In an essay of 500-1,000 words: share a story about how language has helped you find your voice. In two double spaced pages, write an essay including the following: a brief biographical sketch, your desire to attend college, future career aspirations, recent community service, social justice work and/or demonstrated leadership ability, and why you deserve to be a recipient of the SACAC Extend the Dream Scholarship. In an essay of 500 words or less, share what adversities you have had to overcome in order to excel in your high school career either behaviorally or academically and how these challenges have defined you as a person. In an essay of 500-750 words, Select ONE environmental issue from below, explain how it is made worse by population growth, and describe what measures you would recommend our nation’s leaders take to ensure we protect our fragile environment for generations to come. In 500-1000 words: Why should CBCF invest in your education through this scholarship? Your response should include relevant personal experiences, goals, leadership and service activities, academic and career aspirations, obstacles overcome, achievements, and other details you feel will help reviewers understand you as a student and individual. Submit two letters of recommendation. It is suggested one come from a community or public service leader (i.e. church leader, community leader, volunteer organization). With advancements in medicine, there are more elderly Americans in the year of 2017. Unfortunately, as many as 5 million Americans over the age of 60 are victims of elder abuse each year. According to the Nursing Home Abuse Center, only 1 out of every 14 incidents of elder abuse are reported to local or state authorities. Based on your research, create an infographic to help the public better understand this silent epidemic. Submit original infographic to email: aldavscholarship@gmail.com. The dangers of underage drinking, drunk driving, or distracted driving. Entrants are encouraged to present analysis and possible solutions for reducing teenage injuries and fatalities associated with one of those three topics. Submit high school transcript, photo, SAT or ACT scores and letters of recommendation. The link to your video (if not submitted by mail), name, address, email, etc. In an essay, tell us about yourself and use specific details when sharing your extracurricular activities. Specific details can help us understand how great you are. Personal Experience. Have you had a personal experience with distracted driving? If so, how has it impacted your life? Take charge. Create a realistic distracted driving awareness campaign to effectively reduce the number of distracted driving related auto accidents in the U.S. Please include: ways to better educate the public about the dangers of distracted driving; steps that can be taken to prevent new, young drivers from distracted driving; and actionable steps that can be taken to put an end to distracted driving. In an essay of 500-1500 words, "Describe how one of the local government offices (or type of office) listed on our website has improved your own life and/or the lives of people around you." Discuss what if anything should be done, if anything, by social media and other internet companies to help curb and prosecute cases involving cyber-bullying and harassment. In no more than 500 words: Why are you a good candidate to receive this award? Write an original essay, titled “GearWeAre Academic Scholarship Program”. The Essay topic must focus on how love for the outdoors or outdoor sports helps to attribute to your success in life, to date. Outline successes, failures, and even obstacles which you have been able to overcome to reach your goals. Imagine how that type of perseverance and drive may some day lead to your dream career. Who has influenced you the most? How have they helped you achieve your dreams? Share a photo of the person who has influenced you on Instagram or Twitter using the hashtag #PictureKeeper so we can find your photo on social media. Your Instagram or Twitter account must be public to qualify for the scholarship. In 500 words, explain what you consider to be the best money-related advice you ever received. Who gave you that advice and did you follow that advice or not? In 250 words or less: How will a $3,000 scholarship for education make a difference in your life? Describe why you are interested in learning about how principled entrepreneurship, economics and innovation contribute to the well-being of individuals, communities and society. How have you created value for yourself? How have you created value for others and received value in return? What role, if any, should business play in your community? If none, then why? Describe an instance in which you used economic thinking to create the greatest benefit with the least resources. Why should CBCF invest in your education through this scholarship? Your response should include relevant personal experiences, goals, leadership and service activities, academic and career aspirations, obstacles overcome, achievements, and other details you feel will help reviewers understand you as a student and individual. Describe the three characteristics of leadership you value most. Discuss why you believe that these traits are so important and how you feel that they are developed in an individual. In an essay of 500 words or less, describe the world you come from - for example, your family, community or school - and tell us how your world has shaped your dreams and aspirations. one letter of recommendation from a faculty member, employer or other community member familiar with your academic performance. completed FAFSA (students must have demonstrated unmet, financial need as verified by the college or university). Describe your educational career and life goals. Explain your plan for achieving these goals. Include your degree/major, why you selected it, and how this degree/major will help you achieve your goals.